There are so many milestones in a child's life but perhaps nothing compares to his very first birthday. A perfect time for professional photos! 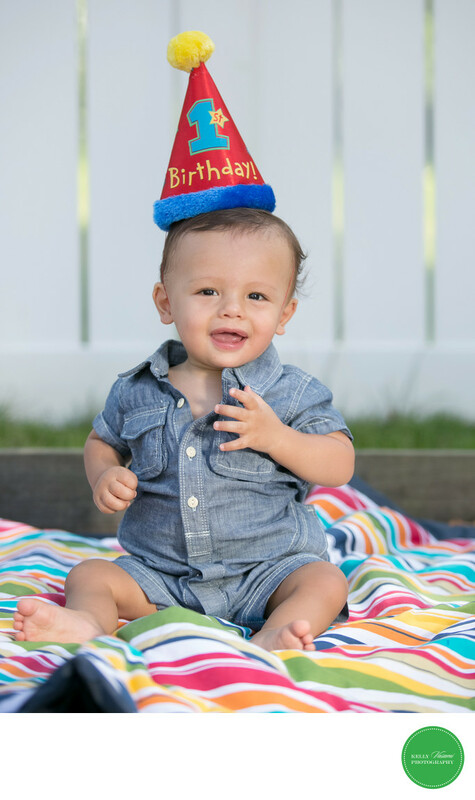 Clad in cool denim and of course a colorful 1st Birthday hat, this one year old sits up easily on a bright blanket in the family's backyard, his brown eyes and sweet smile are one to be remembered for this stage in his life. Natural light flatters his soft skin tone. His little outstretched hand showing his teeny fingers is something his mom and dad will remember fondly. And let's not forget those yummy toes, either.